The hopes of Eastern Washington anglers to shift a larger share of the spring chinook allocation upriver and to the lower Snake River appear to be going nowhere. A seven-member working group of lower Columbia, Gorge and Snake River angling interests waned to conclusion during a meeting in The Dalles, Ore., this month without a consensus for change. Status quo allocation of Columbia River spring chinook impacts in the sport fishery is 75 percent downstream of Bonneville Dam and 25 percent upstream. Washington and Oregon officials will meet at 10 a.m. Wednesday in Vancouver to adopt spring chinook angling regulations for 2014. Columbia Gorge and Snake River representatives at the recent meeting contended that 60 percent for the lower Columbia and 40 percent for upstream of Bonneville Dam would be a more equitable distribution based on a variety of criteria including river miles, hatchery production and sales of Washington's Columbia River salmon-steelhead endorsement license fee. Lower Columbia representatives countered with different criteria, not the least of which was that East Side interests did not factor in Oregon anglers -- with the large Portland population -- when calculating what's equitable. Oregon has initiated its own Columbia River salmon- steelhead endorsement fee this year. That will indicate angler distribution south of the Columbia River by next year. 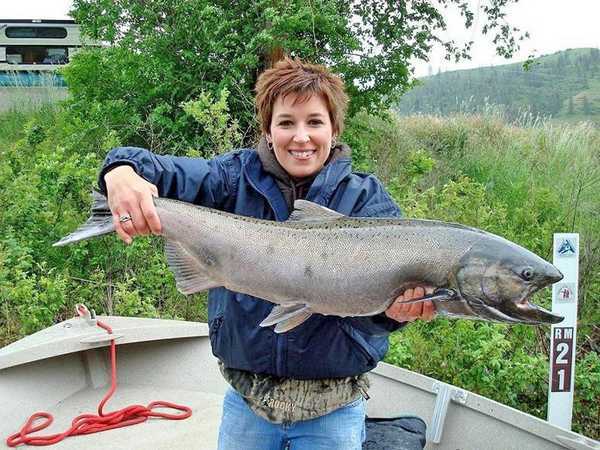 The spring chinook working group that met this month was initiated when East Side interests complained to Phil Anderson, Washington Department of Fish and Wildlife director, about spring chinook sport allocations. Tony Nigro of the Oregon Department of Fish and Wildlife told the working group that Oregon's Fish and Wildlife Commission adopted its Columbia River salmon policy in June and reworking the sport sharing is not an agency priority. But, Nigro said, if there was a groundswell for change among the working group, followed by the bistate Columbia River Recreational Advisory Group, and then the general public, department staff could present the issue to its commission. "There needs to be a broad-based consensus and support for doing something different," Nigro said. With Oregon's agency facing budget cuts, and the biggest overhaul of lower Columbia River sport and commercial fishing practices in decades coming in 2014-2017, the department has little staff time to devote to new and contentious issues, he added. Anglers in the lower Columbia have caught 77 percent of the sport spring chinook harvest on average in the past four years between the three geographic areas. Nathan Grimm of Pasco said land-use practices and other economic changes are occurring east of the mountains to rebuild salmon runs. "You're telling the people who are making sacrifices they can't have benefits,'' he said. Ron Roler, WDFW Columbia River policy coordinator, presented several scenarios for changing allocations. The sport share of upper Columbia spring chinook is increasing from 65 percent to 70 percent in 2014 through 2016, then to 80 percent in 2017. One of Roler's scenarios gave all of the chinook wrestled from the commercial fishery to the mid-Columbia and lower Snake. That scenario got no support from lower Columbia interests, noting that East Side interests participated little in the decades-long allocation fights with the commercials. Participants agreed that the bistate Columbia River Recreational Advisory Group lacks representation from upstream of Bonneville Dam.